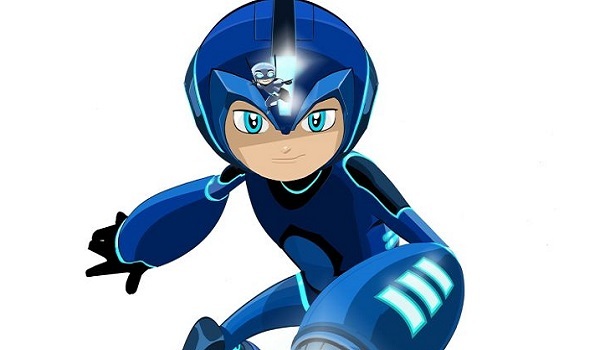 Every kid dreams of becoming their favorite video game character, which appears to be the hook of the new Mega Man animated series heading to the airwaves next year. The new show’s first image is also now available to clap your peepers on. The folks over at IGN got their hands on the first image of the new Mega Man, which will appear in an animated series come 2017. The show is a collaboration between Dentsu Entertainment USA and DHX Media, who will co-produce the new project. The crazy part is how long this has taken to come together, as the show was first announced about a year ago. Still, the good news is that Man at Action Entertainment is behind the production, who you might know from such projects as Big Hero 6 and Ben 10. You can definitely see the Ben 10 DNA in the image below, which shows off the newest iteration of the Blue Bomber. According to the official announcement, Mega Man will this time take on the alter-ego of Aki Light, a young kid who just so happens to also be a robot in disguise. No, not a Transformer, though now crossover ideas are popping up in the back of my brain. Instead, Aki has the ability to call on the Mega Man suit of armor, complete with his buster cannon. He’ll be joined in his adventure by familiar faces, like Mega Man’s K9 robot companion, Rush, as well as brand new characters like the freshly introduced Mega Mini. The new version of Mega Man, joined by Mega Mini, can be seen below. The new Mega Man show is geared toward youngsters six to nine years of age, as well as their parents who grew up playing the Capcom series that first got its start in the late 80s. The series is gearing up to celebrate its 30th anniversary next year, so we’re guessing that the 2017 launch of the show is primed to be a part of that celebration. It’s got us wondering, though: Will a new game also be part of that shindig three decades in the making? We’ll be interested to see what types of baddies this new version of Mega Man has to face. It’ll also be cool to see if, when Light defeats said baddies, he has the ability to earn their special attacks. We’re also curious if the evil Dr. Wiley will be involved, or if Light’s nemesis will perhaps be another youngster. Until we get more than a single picture, all we have left to do is sit and wait. Playing Mega Man’s spiritual successor, Mighty No. 9, might help pass the time, but folks don’t seem to be too keen on that particular game due to delays that have pushed it about a year past its original expected launch date.